Geographische Beschreibung des Gelobten Landes Canaan, Welches unserem Herrn und Seeligmacher Jesu Christo und seinen Aposteln durchwandert worden. This is a beautiful and uncommon c.1700 German variant of the Visscher Family's important map of the Holy Land or Palestine or Israel, or as it is titled (in rough translation) Geographical description of the Promised Land of Canaan, Which have been traversed by our Lord Jesus Christ and His apostles. Oriented to the east, the map covers the whole of the Holy Land on both sides of the Jordan River from Tripoli to Rafah. Throughout, tiny vignettes illustrate episodes from Biblical lore, including St. Paul's journey from Jerusalem to Rome, and the lost Dead Sea Cities of Sodom, Gomorra, Adama and Schoim. Fishing boats populate the Sea of Galilee and major trade routes are noted. A beautifully illustrated title cartouche is included in the lower right quadrant while another large vignette in the upper left illustrates the Crucifixion of Jesus. Verso of the map includes German text featuring the 'Geographical description of the Jewish state.' 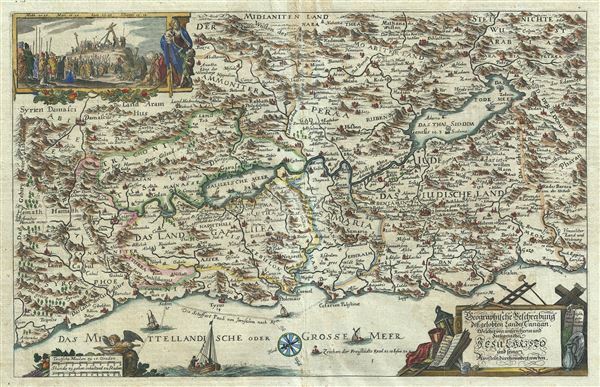 This map is an enlarged German version of a 1645 map originally published by Nicholas Visscher. Very good. Original platemark visible. Minor wear along original fold lines. Centerfold top exhibits some toning and a minor slit.